Saturday morning brings part two of the Canadian Culinary Championship – the highly stressful Black Box competition. Each chef is allowed one sous chef to assist them and we all gather in the lobby of the hotel at dawn and head off in a charabanc to Okanagan College. There, the kitchens of the Culinary Arts department have been transformed by the staff into a perfect arena where three chefs can cook at the same time, each one with a generously stocked communal pantry upon which they can draw. Meanwhile our producer, Peter Moscone, has set up elaborate cameras and screens so the audience can see everything – a live feed that also goes out on the internet for all to see. Judge Andrew Morrison is our inexhaustible colour commentator in the kitchen. Each chef has an hour to make 15 plates of a single dish using all seven ingredients from the Black Box. Here’s what we put inside it this year: Lion’s mane mushrooms from Gruger Family Fungi, Nisku Alberta; half a gram of saffron from Martin Albert at True Saffron, Northumberland County, Ontario (who knew saffron grew in Ontario? ); sweet potatoes – a fascinating prototype variety developed for Manitoba’s short growing cycle at Assiniboine Community College, Brandon, Manitoba; buckwheat groats, still in their hard black husks, provided by Tony and Penny Marshall of Highwood Crossing in High River, Alberta; a tub of rich, tangy sheep’s milk yogurt from Shepherds Gourmet in St. Mary’s, Ontario; a bag of whole chestnuts from Sylvia Koal of Koal Orchards in Kelowna; and quinces from Mikuni Wild Harvest, also in Kelowna. required considerable labour to make them palatable. It was fascinating to see how each chef rose to the occasion and the standard of the dishes was remarkably high. The first chef to open the box was Chef Katie Hayes (Newfoundland). She made miniature ravioli (nicely al dente) filled with finely chopped mushroom and chestnut, subtly spiked with garlic and shallot. She diced and poached the quince and turned the sweet potato into a smooth, rich purée. The saffron flavoured a smoth butter sauce for the ravioli while the yogurt became a second sauce, flavoured with citrus and chives. Chef toasted the buckwheat and tossed it with breadcrumbs then scattered the mixture over her dish, finishing the plate with an aromatic grating of parmesan cheese from the pantry. 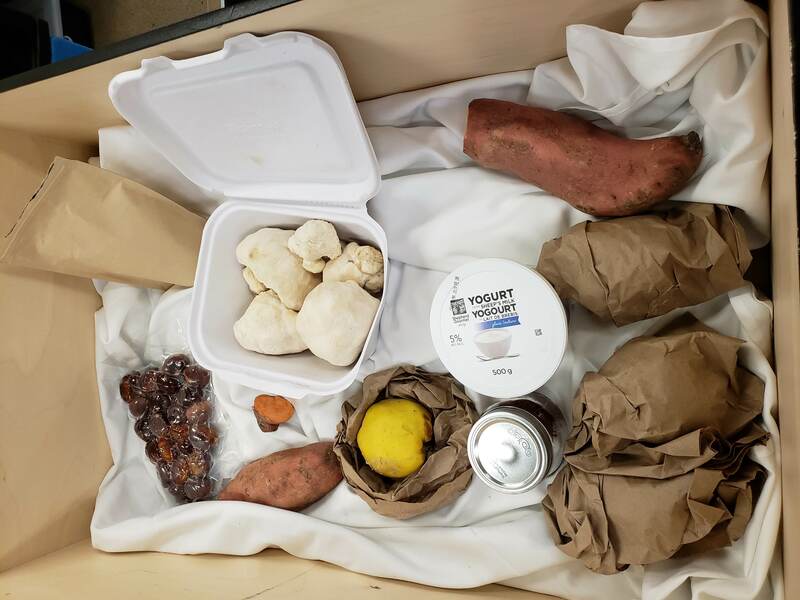 Fifteen minutes after Chef Hayes began, Chef Dave Bohati (Calgary) and his sous were summoned from the waiting room and shown the mystery ingredients. Chef lightly pickled chunky pieces of the lion’s mane mushroom then battered and deep fried them – they looked like golden sweetbreads. 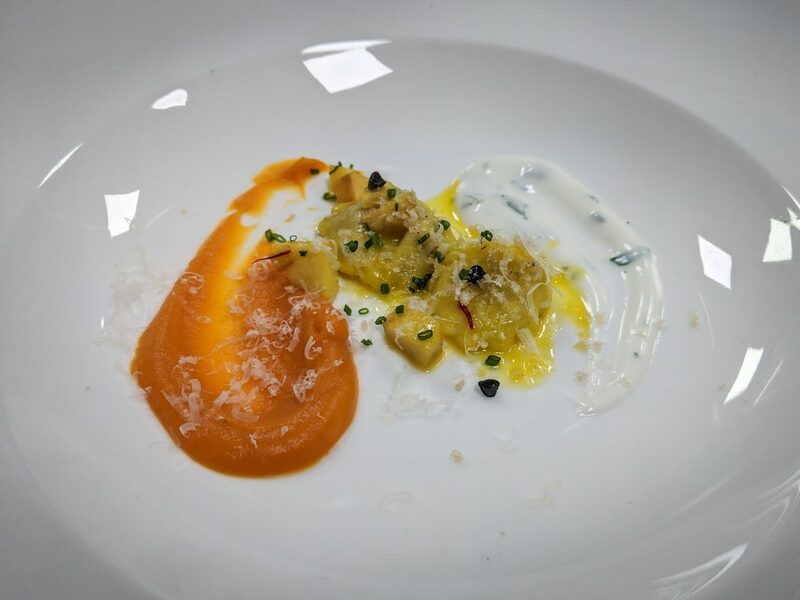 He made a saffron dough and formed it into agnolotti stufed with a filling of mashed sweet potato and yoghurt, with a touch of cumin and pancetta from the pantry. A teaspoonful of silky quince-caramel purée reminded the judges that our ingredients could also be used for a sweet dish. 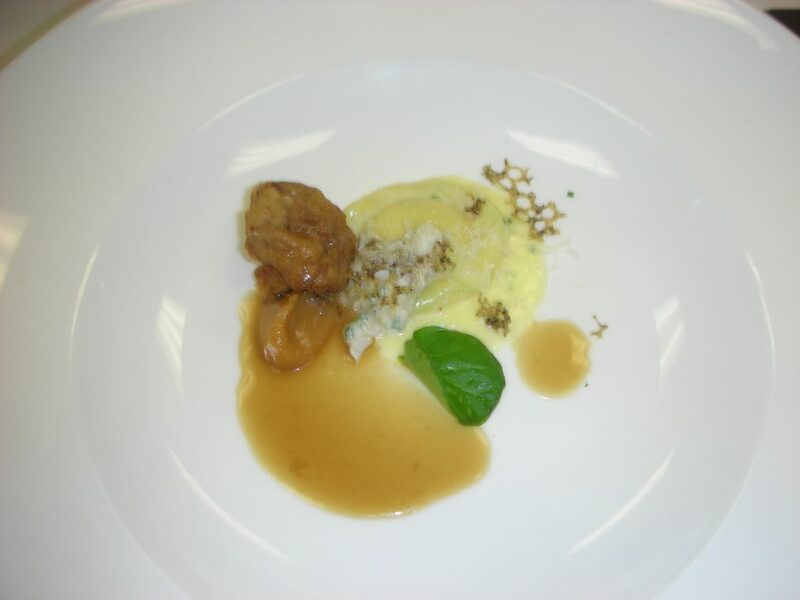 Chef roasted the chestnuts and gave them a light pickling and then returned twice more to the yogurt, using it to sharpen a rich beef stock beurre and also adding a dab on top of the ravioli to give it an extra tang. He coped brilliantly with the tricky buckwheat, pulverizing it to a flour and using it to make a lacy, crispy little tuille. 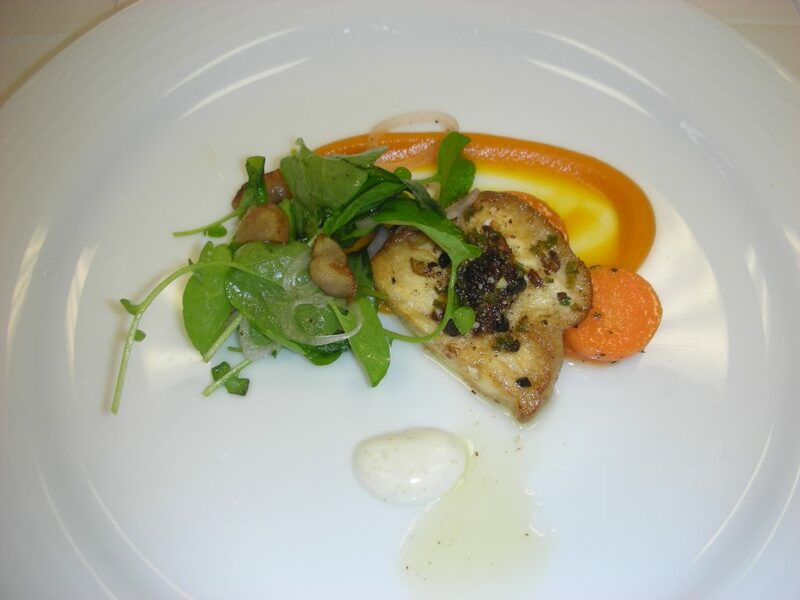 Chef Yannick LaSalle (Ottawa-Gatineau) was our third competitor. He cut discs of sweet potato and crusted them with ground buckwheat and panko before frying them. Then he set the crispy morsel on top of a mound of “sofrito” made by chopping and cooking the mushroom, quince and chestnuts with onions, garlic, ginger, chili and parsley, deglazing the pan with white wine. Part of this mixture was buzzed in the blender then folded into the other half to produce a textured melange of flavours and textures. Chef set this onto a sauce of saffron-infused yoghurt, flavoured with mint, basil and lemon and garnished the dish with fresh leaves of basil, mint and cilantro. Chef Irwin MacKinnon (New Brunswick and P.E.I.) took a completely different and most delicious route. He made a loose, savoury purée of the sweet potato and flavoured it with a mixture of the South Asian spices from the pantry. Infusing the yoghurt with saffron he dribbled just a little of the vivid yellow cream over the purée. He peeled and halved the chestnuts, candied and roasted them (the best chestnuts of the morning) and diced the quince before giving it a sweet-sour-spicy pickling. 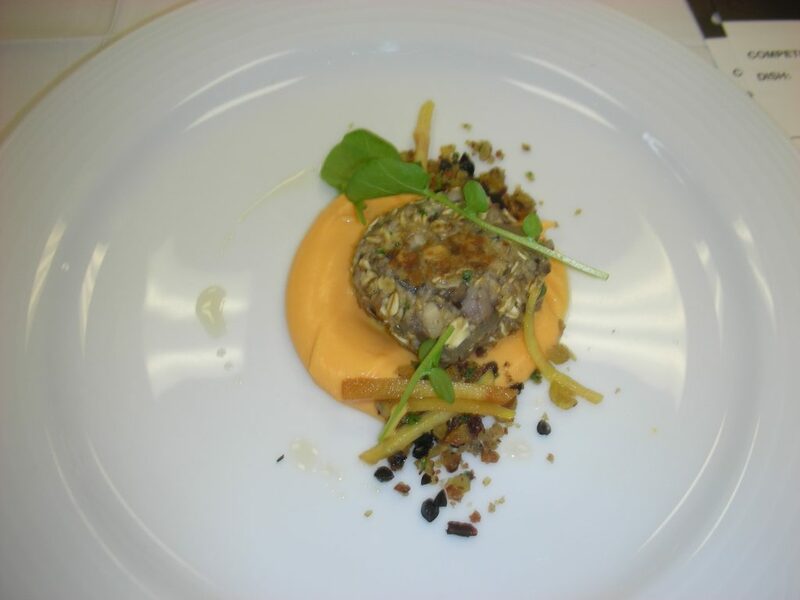 The centrepiece of the dish was a juicy slice of the mushroom crusted with toasted buckwheat and pan-fried. The fifth chef to open the box was Chef Takashi Ito (British Columbia). He managed to crack and separate the buckwheat from its husks, mixed the kernels with the chopped mushrooms and wrapped them all in dough to form dumplings. He puréed the sweet potato and infused it with saffron and made a quick “chutney” with the chopped quince using sugar and vinegar. He peeled and dep=fried the chestnuts, chopped them finely and mixed a little into the yogurt, sprinkling paprika on top. 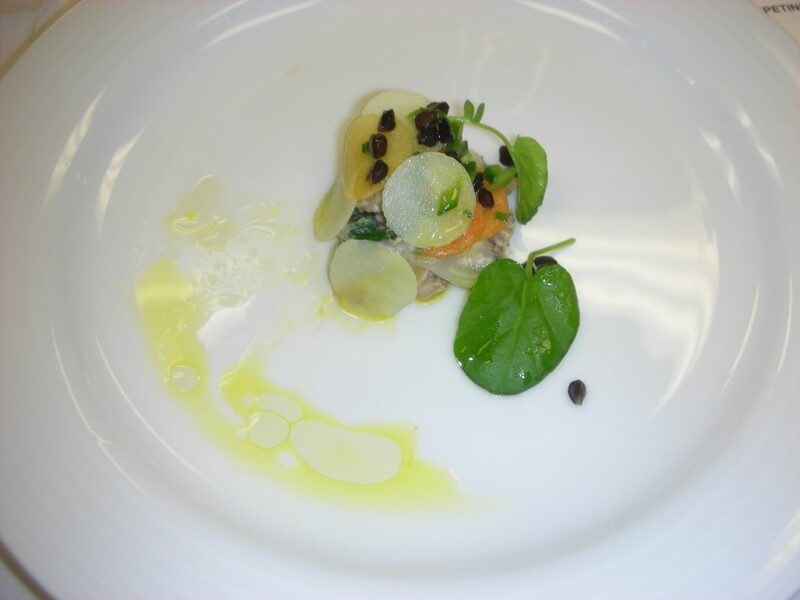 Garnished with threads of pickled shallot and a single green baby spinach leaf, the plate had a charming simplicity. Unfortunately, however, the pastry of the dumpling was seriously undercooked. Chef Jason Morris (Montreal) was our sixth competitor. He began by chopping and braising the mushroom and chestnuts then binding them, using a little of the yogurt, into a finely textured “chutney.” This he used as the base and also the crown of the dish, beneath and above a dainty “mille-feuille” of colourful vegetables (sweet potato, potato, celeriac and the blanched quince) cut into discs the size of nickels. 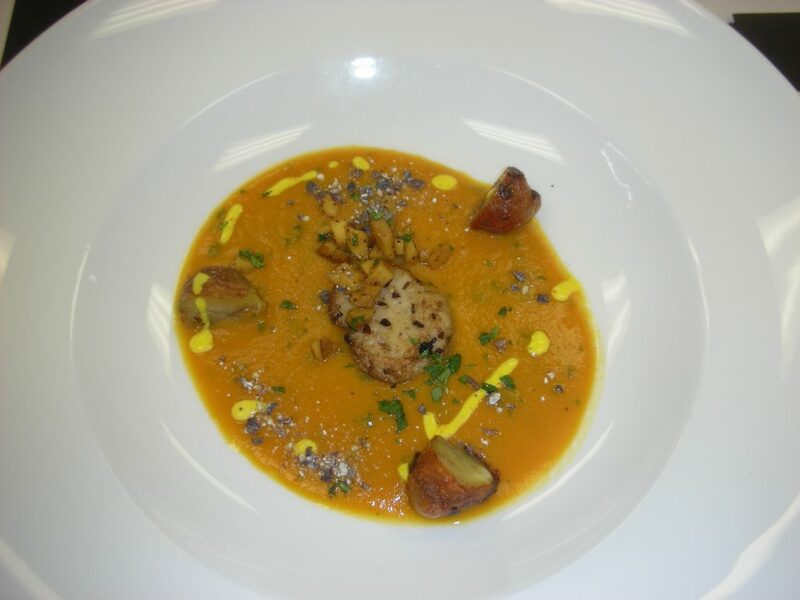 As a sauce, Chef made a clear and ethereal broth from the quince scraps, saffron and ginger, delicately textured but full of saffron flavour. He toasted and boiled the buckwheat with a little jalapeño in an effort to give the bland grain some personality, then garnished the dish with watercress, chopped chives and a hint of lemon. Up next was Chef Thomas Carey (Nova Scotia) who made the lion’s mane mushroom the star of his show, roasting a thick slice with brown butter and crusting it with a buckwheat crumble. Juicy and at once earthy and rich, the mushroom worked well with a sweet-tart purée of quince and saffron (one of the best uses of the quince all morning). The chestnuts were roasted and shaved then finished with butter and stock; coins of butter-poached sweet potato were delectably tender. 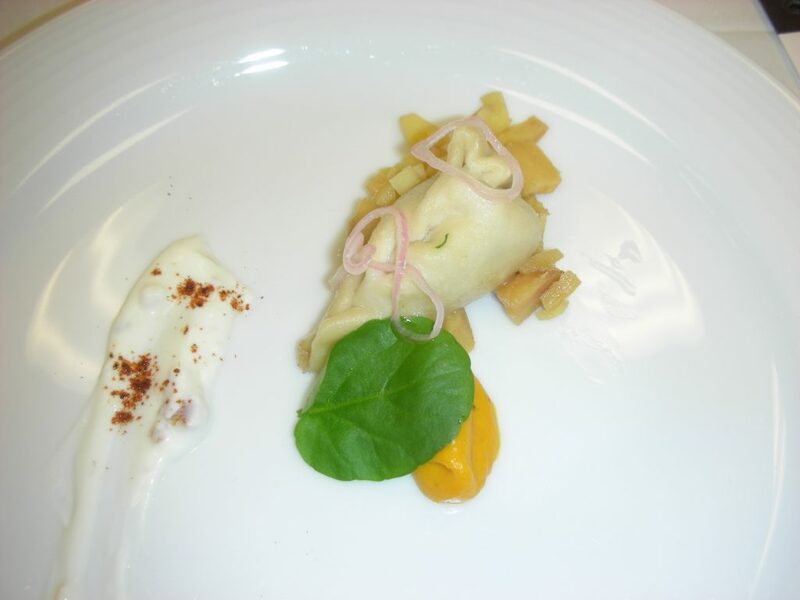 The yogurt became a sauce, scented with citrus and cumin, and the dish was garnished with rings of pickled shallot and a small salad of watercress. What did Chef Jesse Friesen (Winnipeg) do with his ingredients? 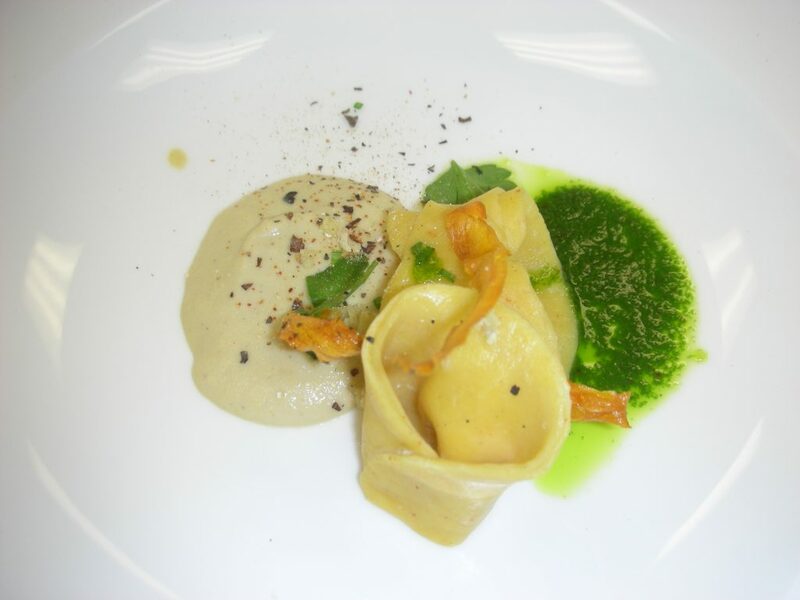 He made a saffron dough, rolled it out and twisted it into firm tortellini with a filling of goat cheese, quince, yogurt and mint. A dusting of grated chestnut ticked that particular box. The lion’s mane joined forces with wine and other mushrooms from the pantry and was blutzed into a purée to serve as a sauce for the pasta, balanced by a second sauce of parsley oil on the other side of the plate. Chef cut ribbons from the sweet potato, seasoned them with ground buckwheat, chili, salt, cumin and pepper and fried them to a crisp to use as a garnish. 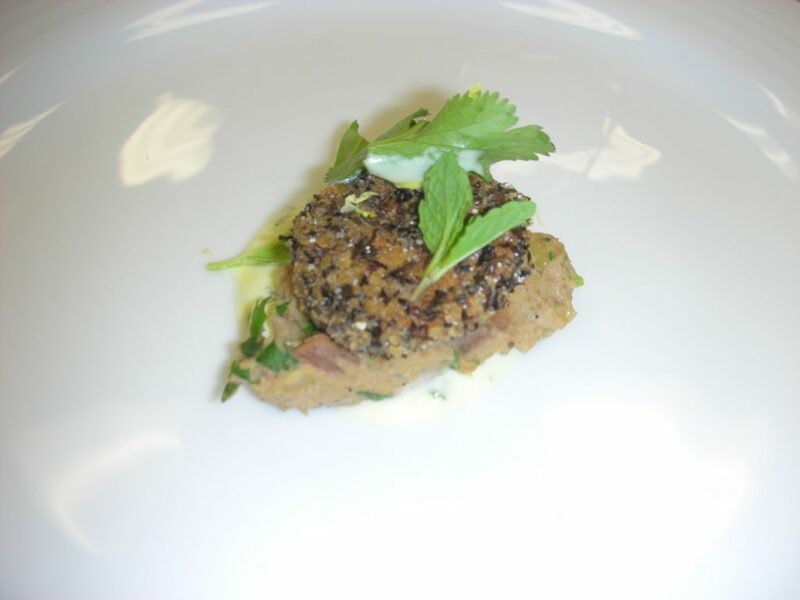 He sprinkled a little more seasoned ground buckwheat over the dish then sent it in to the judges. Chef Davina Moraiko (Edmonton) used her lion’s mane to make a soft-textured cake, mixed with and rolled with oats, its flavour full of mushroomy personality. A purée of sweet potato and yogurt benefitted from the dairy’s lively tang. Chef made a sweet-tart gastrique scented with saffron and used to pickle her julienned quince. The buckwheat joined forces with the chopped roasted chestnuts to create a savoury crumble to the north and south of the dish which was finished with a sprinkle of watercress fronds. 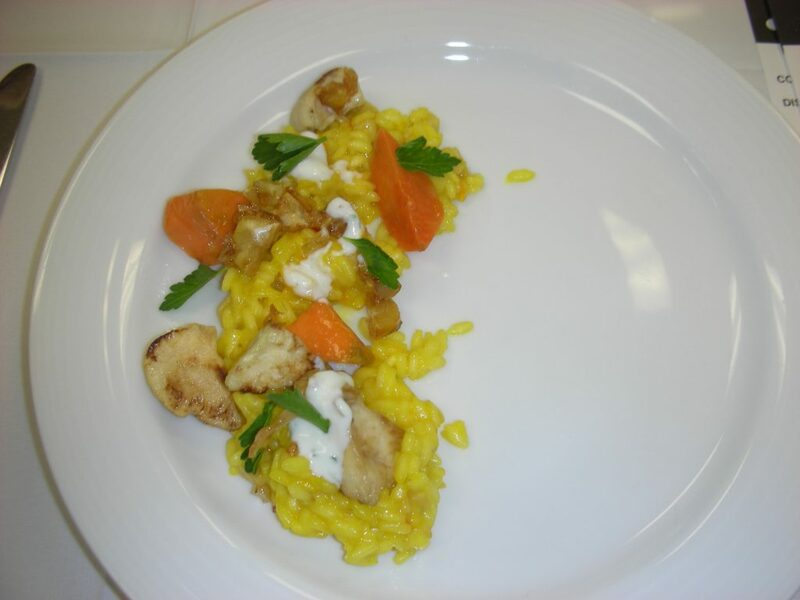 Chef Elia Herrera (Toronto) chose an altogether different path, making a classic saffron risotto, each grain of rice toothsome and correctly textured. Little chunks of roasted, caramelized chestnut surprised our palates with sweetness while the sweet potato was cooked into bigger pieces and jumbled up with morsels of glazed quince. The mushrooms were gorgeous, roasted and slightly brown from the oven and Chef made a dressing of yogurt, jalapeño, basil and lemon zest to garnish the top of the risotto. Alas, the buckwheat was nowhere to be seen on the plate, though Chef had set it to boil earlier. Marks were lost. The final competitor to open our box was Chef Christopher Hill (Saskatoon) who had the novel idea of creating a vegetable taco for his dish. For a wrap, he rolled out corn dough and cut out perfect circles, toasting them in a very hot, dry pan. He made a salsa roja, like a thick purée, out of the buckwheat and chestnuts, then chopped and stewed the mushrooms with shallots, garlic, vegetable stock and a hint of cumin. A dot of thick, smooth quince and saffron jam was included on the wrap, with a little foamy jalapeño crema. He finished the thought with a finger-sized piece of sweet potato, coated in cornmeal, cumin, paprika and salt and quickly fried. Cilantro and a spinach leaf were the final garnish. The dish was delicious and original and made most sense when rolled up and eaten – as any taco does! We judges retired to our hotel to crunch the marks from the Black Box. 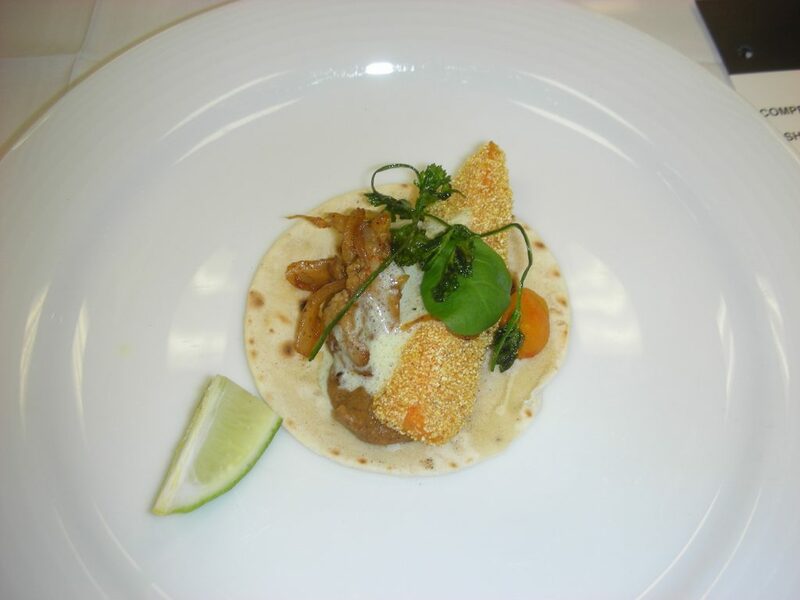 We were pleased with the variety of dishes the chefs had prepared and with all the creativity shown. Next year, we decided, we will introduce a new criterion to the judging – risk-reward – in an effort to encourage even more adventurous ideas. The marks showed Chef Bohati winning the morning contest (thanks in part to his elevated treatment of the rascally buckwheat), closely followed by Chef LaSalle and Chef Hill, with Chefs MacKinnon and Morris in joint fourth place, hard on the leaders’ heels. It was still a very open championship indeed.